I like the baseball cap idea! I see that your example is a visor. ... You have to keep in mind that for some of us old guys, we have some thinning space up there and a visor would expose the problem we try so hard to deny!! ... Depending on how much effort one wanted to put in on the project, a reasonable consideration would be to go with an adjustable cap, however, it should not be too difficult to figure out the sizes we would need for ordering traditional caps. With a traditional cap we would be able to have Sea Isle City in small letters on the back with an small American Flag. You can order the caps with the American Flag already affixed. So what do you think? 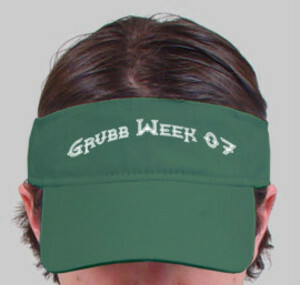 Do you like the idea of a Grubbweek hat? Post your thoughts in the COMMENTS section (by clicking on the word "comments" below). Or, as I'd like to call it, the GGTFO. Let me explain. In an effort to make the Grubbweek t-shirt selection process more democratic, I'd like to open it up to everyone. I know traditionally the shirt has been designed in a super-secret fashion - by a cabal of privileged family members who guard the end product with excruciating smugness. Hinting at the possibilities, dodging questions and not revealing anything until money is in hand. In true Revolutionary fashion, I say Power to the People! Let's throw off the shackles of this oligarchy and open the floodgates to everyone's opinion. No voice is too small. If Taylor wants to weigh in - his opinon should be considered. If Amy feels a certain twang of morning sickness as a result of contemplating a specific design - we all should know about the smallest Grubb's distaste. And let's not discount our elders. If Vince can figure out how to use the "series of tubes" we call the interweb - his voice shall be heard. Once we have a visual, we'll post it to this site for critique, and I'll send out an e-mail alerting the entire Grubb community. 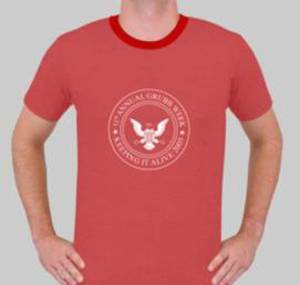 One thing I haven't figured out (besides how to program the html for a voting function) is how we "elect" our winning design. Should we gather them all and have a straight up vote for your favorite? Should we create an elaborate bracket system? Or should we be true to the name of this site and have a Face-Off the moment we have two designs to compare? What are your thoughts? Share them in the Comments below!